Part of the fun of visiting a new city is picking out all the great souvenirs you want to bring home, either to remind yourself of how much you loved this corner of the world, or to introduce a piece of a new place to friends and family (and let them know you were thinking of them while you were out exploring, of course). In Krakow, you’ll have no problems finding plenty of gifts to stuff in your bag — your only problem will be making sure you can close your suitcase after all that shopping! Here are some of the best souvenirs to bring home from Poland. Pretty much no one leaves Krakow without a Wawel Dragon in their luggage. Any shape and form is allowed (okay, preferably green, but it could even be a pink one), emblazoned on a t-shirt with city slogan, as a keepsake keychain or clay figurine, and even printed onto undergarments. The dragon comes from folklore legend, in which the dragon was a monster on a feeding frenzy, targeting innocent virgins. These maidens were sacrificed to the dragon in order to prevent him from plundering the countryside — that was, until he was thwarted by a local shoemaker, who tricked him into eating a sheep’s carcass filled with sulphur. The dragon became so thirsty from the sulphur that he drank and drank and drank from the nearby Wisła River, until he eventually exploded. You can buy the dragons everywhere throughout Krakow, and there’s even a dragon monument on the riverbank of the Vistula. The word ‘Poland’ originates from the Polan tribe and the word polano means a piece of firewood. The first Poles were people of the forest and even today, 20% of country’s landscape is natural forests. No wonder there are so many wood products available for purchase, and for affordable prices! I highly recommend little sculptures and figurines, wooden chess boards, wooden boxes, and small wooden kitchen appliances. Amber is not a typically Krakowian souvenir, as it originates from the north, in the Baltic Sea, but it is transported via the Vistula River all the way to the south of Poland. You can find amber everywhere, but it’s best to buy it in the Sukiennice (Cloth Hall) market, rather than in galleries or hotel boutique stores — you’ll have more choices and better prices. But if you’re looking for unusual finds (such as specific amber stone shapes or colours), then it is best to go to the specialised stores located on the Royal Route (Florianska and Grodzka streets). Leather slippers, traditionally decorated and handmade by those living in the Carpathian mountain range, are not only a nice souvenir from Krakow, but also have a practical use for while you’re here. When you visit a Polish family home, the unwritten rule is to take off your shoes immediately upon entering the house, and put on a pair of slippers. 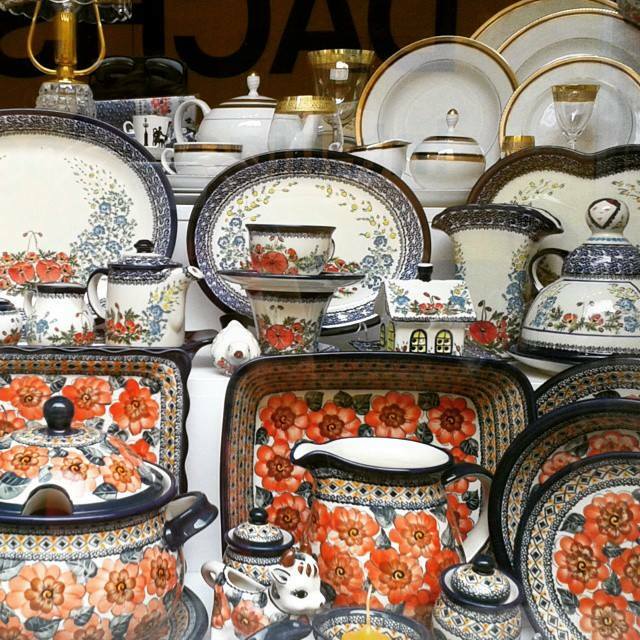 Hand-painted ceramics, reflecting regional patterns, are accessible anywhere in the centre of Krakow and in local stores in the Jewish quarter located at Joseph Street. You can find a multitude of choices from original painted vases to cups and bowls, pitchers, and whatever else your soul desires. Neither crystal nor chalices are easy to transport, however they are one of most beautiful handmade Polish souvenirs. The best known glass products are produced in the Krosno factory located southeast of Krakow. You can also buy engraved glass charms and Christmas decorations. Wicker products like traditional baskets, wicker boxes, and pots are mainly sold in local markets and are worthy of shoppers’ attention, particularly because because they often tend to come from local foundations that teach various crafts to the visually impaired. The best wicker products can be found in the Kazimierz district near Wolnica Square. Of course, we cannot forget about culinary specialties! Even if you’re only in town for one day, you must taste a few delicacies (and pick up some to take home): Cracovian dry sausage, mountain cheese (usually sheep, often called oscypek), pickled cucumber, prunes in chocolate, and Żubrówka vodka. They make excellent gifts and can be purchased in almost any local store, or even at the airport. For those who want a one-stop shop, I recommend Krakow’s Kredens on Grodzka Street, where all these treats are available all the time. Krakow’s squares and markets are much more than a place to shop for groceries. For locals, they are an experience: places to meet with friends (or flirt with lovers! ), to swap stories and the latest gossip, to eat, to shop for local delicacies, and for families to come together. Hop on a locally led tour to discover the best of the city’s markets!